Looney Tunes: Rabbits Run is a 2015 American animated direct-to-video film based on The Looney Tunes Show, produced by Warner Bros. Animation. It is the first new Looney Tunes direct-to-video film in nine years since Bah, Humduck! A Looney Tunes Christmas. The film was directed by Jeff Siergey, a supervising animator on Space Jam and lead animator on Looney Tunes: Back in Action. He was also a director on The Looney Tunes Show. It was released on August 4, 2015 by Warner Home Video, but it was released early on July 7, 2015 on Vudu and Walmart. From his headquarters, NSA General Foghorn Leghorn, his intern Pete Puma, and spy Cecil Turtle oversee an operation on a mountain in the central Mexican jungle. The objective of the operation is to extract a rare flower, as the agents believe it to be the world's most powerful weapon. However, they are beaten to it by Speedy Gonzales. In New York City, Lola Bunny is tired of working for Giovanni Jones at the Acme department store perfume counter. She accidentally damages the store, gets fired and takes a long, awkward ride home in Bugs Bunny's taxi. Arriving in her apartment, she screams when she sees a mouse, even though it's her landlord, Speedy. He gives her the flower as a gift, unaware it is being watched by the NSA. Foghorn sends agent Elmer Fudd to watch the flower, though Lola uses it to create her perfume, which has a side effect of invisibility. She doesn't notice as she accidentally sprays her eye, forcing her to wash it out, rendering her visible. Cecil sends his goons to get it, but Lola backs out the window and falls to Bugs' taxi below. On the way down, the perfume makes the wall invisible exposing, in successive apartments. General Foghorn puts out a reward of $500,000 for Bugs and Lola, and Yosemite Sam, who was preparing to rob a bank in Times Square (with just a short-range water pistol), learns of it and apprehends them. However, he refuses to hand them to the NSA or the NYPD until after he gets the money, and a one-sided gunfight ensues. Lola and Bugs escape and slip down a storm drain. They emerge through a manhole in front of Porky Pig, causing a traffic jam, but Giovanni grabs the perfume. Lola runs after him and gets abducted by Cecil in a van. Bugs jumps in Daffy Duck's taxi and follows them. At a secret location, Cecil and his goons interrogate Lola and leave her to die, but Bugs and Daffy manage to free her. Driving through the streets (and subway tunnels) of New York and running through Central Park, the rabbits make haste to John F. Kennedy International Airport. Daffy envies the ducks in the park and decides to retire. Having been arrested, Sam steals an NSA car and follows Bugs and Lola to the airport, where she spots Giovanni, and they all board the plane as does Cecil. Bugs retrieves the perfume and makes a parachute from clothes in passengers' checked baggage and, after a fight with Sam over the perfume, he and Lola land in the Atlantic Ocean. The Goofy Gophers pick them up in their yacht, try the perfume, and discover its invisibility property, albeit to Lola's dismay, but Bugs convinces her to see the upside. The Gophers subsequently give Lola a makeover while singing a song. They arrive in Paris, and Bugs and Lola spray themselves, subsequently having fun with their invisibility: stealing lemonade, painting a picture of the perfume, smashing the Louvre Pyramid by playing baseball, going skiing in "Ze Alps" and cramming several cars into the Arc de Triomphe. When it rains, the invisibility wears off and they find themselves caught between Elmer Fudd and Cecil at the Pont des Arts, Fudd holding the Gophers hostage. Cecil and his goons betray and disarm Fudd and the Interpol officers he hired with heat ray pistols, and Bugs tries to throw the bottle into the Seine to force the cops to stand down, but Sam catches it. They all dogpile on Sam, but are suddenly teleported to a space station over Mars, where Marvin the Martian grabs the bottle, with Cecil revealing he works to Marvin. Cecil's goons unzip their costumes revealing they are Instant Martians, much to Cecil's confusion. Marvin reveals his plan to make all of Earth invisible, as it "obstructs [his] view of Venus". To do so, he extracts the invisibility part of the potion from the perfume part, but ends up with two identical bottles; one of them has invisibility and the other does not. Bugs and Lola play switcheroo and end up with both of them, handing Marvin a Joker card. They are chased to the Transporter Depot, but everyone crams into one pod overloading the system and causing them all to switch heads, bodies, and other parts. They continue to play body part swap for a while and even Screwball Daffy from Duck Amuck walks across the scene, and they are eventually restored. Marvin catches them, grabs the bottle, betrays/fires Cecil and sprays the Earth with perfume, not knowing that Bugs has switched it so Earth doesn't turn invisible. To Marvin's fury, Bugs turns the group and himself invisible, allowing them to escape the Martians, and they board the Martian Maggot. Before they leave, Bugs tosses Marvin the Illudium Q-36 Explosive Space Modulator, which Marvin was originally going to use to blow up Earth. Ironically, the Modulator blows up Mars instead, killing the Instant Martians and leaving Marvin hanging from a root, remarking "I hate Earthlings." The Maggot returns the rest safely to Earth, landing in the Seine. When they accidentally leave the bottle in the spaceship, sinking with it, Fudd comes to believe the world is not ready for invisibility, and starts a one-sided chase to arrest Cecil for his complicity in Marvin's plan. Lola bitterly forgives Giovanni for stealing the perfume, and happily continues her relationship with Bugs. Unexpectedly, Speedy shows up to collect his "morning croissant" and briefly calls Lola out on her failures to pay rent while being able to visit Paris, before departing for Switzerland. One year later, perfume mogul Pepé Le Pew introduces his newest scent "Lola" and back in New York, Bugs reveals that he still has the invisibility potion, while Daffy has retired to Central Park. In a pre-credit scene, during a parody of the original "That's All Folks!" ending, Porky Pig says "Th-th-th-that's all, folks!" Daffy walks across with and sarcastically remarks "Interesting" whereupon Porky angrily hits Daffy on the head with a frying pan. 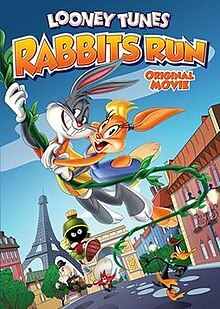 The film was released on DVD with the bonus cartoons "Best Friends" (the first episode of The Looney Tunes Show) and the 3D animated theatrical shorts Coyote Falls, Fur of Flying, Rabid Rider, and I Tawt I Taw a Puddy Tat. The film later premiered on Cartoon Network on March 25, 2016. ^ "Looney Tunes: Rabbit's Run (Original Movie)". Walmart. Archived from the original on July 12, 2015. Retrieved July 12, 2015. ^ "UPDATED: SHOWBUZZDAILY's Top 150 Friday Cable Originals & Network Finals: 3.25.2016 | Showbuzz Daily". www.showbuzzdaily.com. Retrieved 2016-05-14. This page was last edited on 20 April 2019, at 04:32 (UTC).